A violent, epic, action-packed urban quest full of very eccentric, often hilarious, extremely dangerous characters who also happen to be animals -- the wildlife of New York City, to be exact. Treachery leads to a monstrous war amongst the wildlife of New York City, and Patch, a young squirrel, is forced into exile on Staten Island. Patch must journey across deadly, human-ridden streets, parks and sewers to find his home in Central Park and to rescue all the animals from a power-hungry and sadistic enemy -- the King Beneath. Wood engravings by the award-winning Jim Westergard illuminate the scenes and the many animals that Patch encounters. Patch knows something is direly wrong when all the squirrels in Central Park wake to find every foodstore stolen -- and, in the middle of winter, that means starvation. Patch’s mother is gone without a trace and in her den drifts a musky, unfamiliar scent. Hungry, tired and alone, Patch sets off into the ‘mountains,’ the human lands of New York City, to find food and to uncover what’s happening to his family. He finds out too late that a war is brewing beneath his paws. Patch is swept into an deadly battle that unites squirrels, birds, cats and dogs against vicious forces below the ground, rumoured to be led by the mysterious, legendary King Beneath. Gripping and suspenseful, Beasts of New York is a gritty urban fantasy populated by unforgettable characters as vivid and complicated as humans: from mercurial Zelina, the Queen of All Cats, to Snout, a massive and power-hungry rat, to Karmerruk, an arrogant, dangerous hawk. Evans’s New York City of wildlife is deeply imagined; the urban landscape wavers between the familiar and the disturbingly bizarre, while Jim Westergard’s intricate wood engravings illuminate the settings and many characters. Evans, a master of dark crime thrillers, brings his fast-paced energy to an entirely new world -- one right under our feet. ‘This book reads like a fantasy novel, even though it is set in New York City. The horrors that Patch encounters at times seemed so unreal to me, despite knowing where they were. Seeing them from another pair of eyes gave some things a new air of terror and others one of wonder. The best part about this book, though, is what saves Patch over and over from being preyed upon by bigger animals: his ability to communicate across the species barrier. Patch is able to speak bird, which earns him respect and memorability from the birds he encounters. It is because Patch is such an efficient communicator that allows him to make friends with the other animals he meets, who turn out to be helpful acquaintances in the long run. Early on in the book, Evans speaks of animal communication, in that it is not made up of words or sounds, the way human language is. Instead, animals communicate with each other using a system of sounds, movements and body languages. As a human reader interpreting Patch’s discussions with other animals, I always got a kick out of what they would say to each other. When Patch meets a dog in the street, the dog strains to the end of his leash, shouting "Kill you and eat you! Kill you and eat you!" at Patch over and over. This made me giggle, as it’s pretty much exactly what I would imagine a dog would say to a squirrel in such a state! Since reading Patch’s amazing adventure story, I have noticed that I now look at animals in a whole new way. My initial reaction when I received Jon Evans’ Beasts of New York in the mail was, what a beautiful book! With the rise of e-reading, I’ve long believed that the future of print publishing is in books that are practically works of art. [...] So, when I saw the absolutely beautiful way Porcupine’s Quill printed Beasts of New York, I fell in love with the textured, cream-coloured pages and the ornate letters that opened each section. I also love the wood engravings by Jim Westergard. I was totally grossed out by the one of the rats, but overall, they’re beautiful. I love how realistic the fur looks, and am amazed whenever I remember that these images were originally created on wood. This book is a work of art, an example of the kind of reading experience e-books can’t offer (an image of a wood engraving on a screen will also be beautiful, but not quite as beautiful as on this type of paper, I think). I was afraid the book would end up being like a nature documentary. Luckily, however, the story becomes much more involved than that. I quickly became intrigued by Patch’s adventures, and loved seeing New York City through his eyes. Cars become "death machines" and apartment buildings are "mountains." In the hands of a lesser writer, I can imagine such descriptions being cutesy, but Evans pulls it off. At times, even I felt like I was traveling in a hostile, utterly alien environment, and I grew up in a city! Beasts of New York is a contemporary urban fable, geared for adults, but also a story that I think mature kids will appreciate. There aren’t a lot of adult books starring animals, and Evans’ animals seem less anthropomorphized than the books and movies I remember. Beasts is an exciting tale overall, and a beautiful, beautiful book. 1. Why do you think Evans chose to use animals for characters in his ‘children’s story for grown-ups’? How does his use of animals influence the progression of narrative? What is the nature of each species in Beasts of New York, and are there ever exceptions to these species’ average characteristics? 2. Above-ground and underground are often positioned as opposites in Beasts of New York. What do different heights signify? How are the animals’ personalities revealed by their interactions with the levels of a city? What possible symbolism lies behind the opposition of above- and underground? 3. How does this novel follow or uphold epic fantasy conventions? 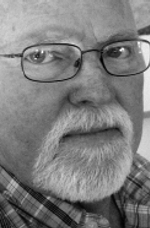 How does the novel challenge those conventions? If you were a bookseller, how would you categorize this novel in your store? 4. 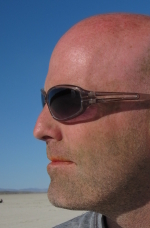 Evans intentionally changes his style of writing as the story progresses. Compare the first three chapters to the last three. What differences do you notice? 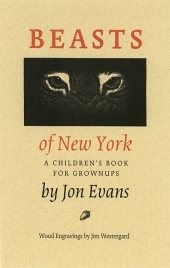 How do these changes reflect Evans’s claim about Beasts of New York that it is a ‘children’s story for grown-ups’? Do you agree with this claim? Why do you think Evans believes this? 5. What does Patch realize about himself by the end of the story? How has he changed? Do you think Patch would have grown or developed in the way that he did regardless of the events in the story? Did Patch display any potential (for leadership, goodness, bravery, trickery, etc.) in the beginning, or did he only develop those traits as a result of hardship? What implications does your answer have for the concept of a hero’s journey? 6. Zelina, the Queen of All Cats, also changes dramatically over the course of the story. What do we learn about the nature of royalty through Zelina? What do we learn about the creation of identity? Do most of the characters in Beasts of New York undergo a similar transformation (in one way or another) as Zelina? 7. Most of Evans’s other novels are international thrillers. Can you see any hints of this in his style or theme in Beasts of New York? 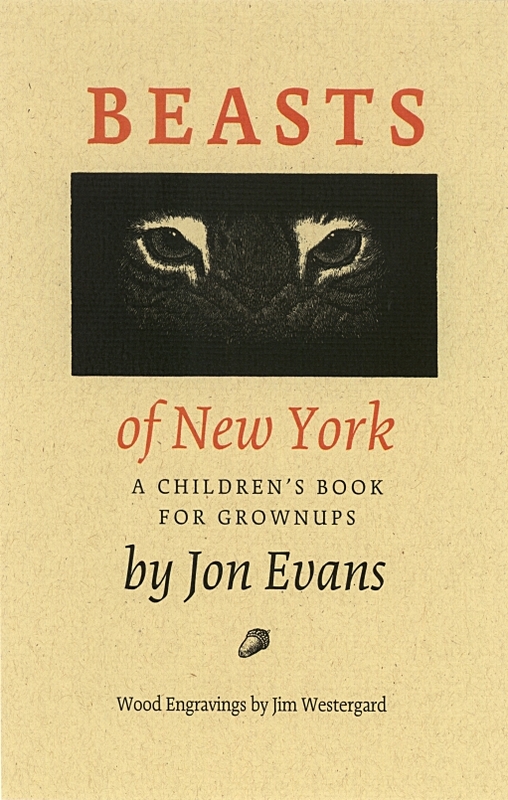 How do you think Evans’s previous thrillers influenced his telling of Beasts of New York? 8. Many reviewers mention that one of Beasts of New York’s most interesting aspects is its representation of the relationship between animals and humans. How do the various species view or interact with humans? Do you think there is an advocacy of environmentalism in Beasts of New York? Is this an environmentalist work? Why or why not? 9. Although the animals talk and feel emotions like humans, can you find any important differences between the animals’ thought processes and our own? Consider the animals’ attitudes towards love, death, tradition, family, and responsibility. ‘I think we should go,’ Toro said. ‘Not yet,’ Patch repeated. He watched the dust clouds in the pit, the way they moved. He didn’t want to be upwind of the rats. They too had sharp noses. He ran along the top of the fence, as far downwind as he could, and then he took a deep breath and ran straight down its side. ‘But --’ the squirrel began. 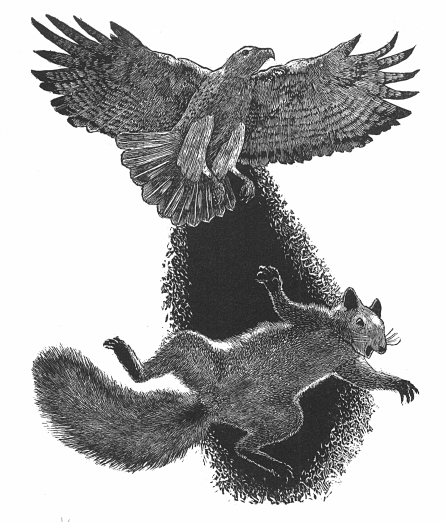 ‘You said you would show me Jumper,’ the squirrel said hesitantly to Snout. There was a dark hole in the corner of the pit, near where the rats and the other squirrel stood. Patch saw motion in that hole. He saw a squirrel’s head emerge. He watched, shocked, as Jumper, lord of the Treetops tribe, crawled painfully out of that hole, his motions slow and spastic, and fell clumsily to the ground. Jumper was bleeding in many places, and he pulled himself along with his forelegs alone; both his hind legs hung motionless from his body. Several rats followed Jumper out of the hole. ‘Lord Jumper won’t be jumping any more,’ Snout said, and laughed. The other squirrel looked uneasy, and didn’t answer. Patch was glad to have his name. It was Redeye he had smelled in Silver’s drey. Snout stepped away from the knot of rat-tails on which he stood. The knot began to squirm like a nest of worms as the rats untied themselves from one another. As they were released the rats formed into a tight circle around Jumper. Snout joined the circle. So did Redeye. Patch knew what would happen next. He didn’t want to watch. But it was too awful a thing to turn away from. And then they swarmed the crippled lord of the Treetops. Jumper howled three times before he fell silent beneath the frenzied mass of biting rats. Redeye seemed more rat than squirrel as he tore at Jumper’s body with his sharp fangs. In scarcely more time than it takes to tell it there was nothing left of Jumper but scraps, bones, and a puddle of blood. Even then the rats began to gnaw on Jumper’s bones and lick his blood. They would leave nothing of him at all. Patch retreated silently to the wooden plank that led out of the pit. He felt colder than he had on the worst day of the winter. The squirrel Redeye had betrayed Jumper to rats, helped to kill him, helped to eat him. And Redeye’s scent had been in Silver’s drey. Patch climbed numbly into the sunlight, over the fence, back to the concrete, heedless of the passing humans and the death machines. They held scarcely any terror for him now; all he could think about was what he had seen in the pit below.